This article is about the prefecture-level city of Henan. For other uses, see Anyang (disambiguation). 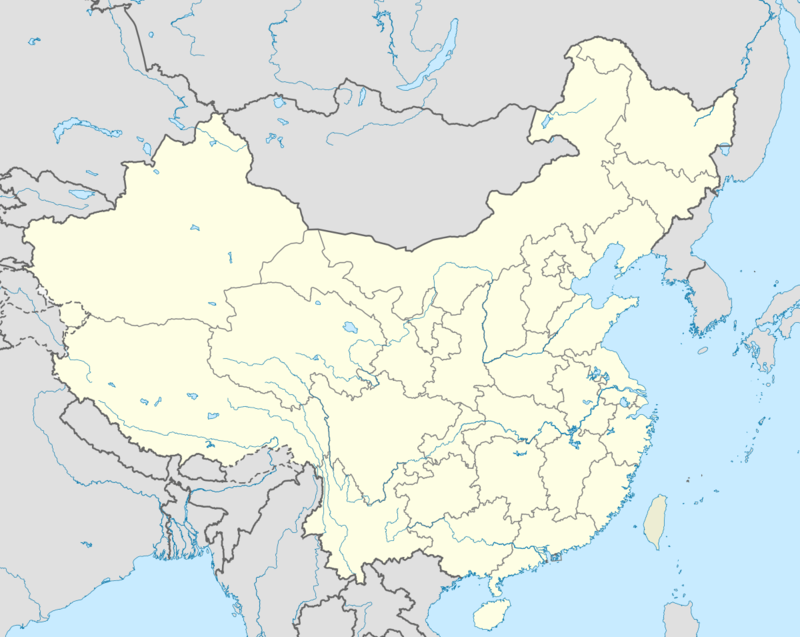 Anyang (simplified Chinese: 安阳; traditional Chinese: 安陽; pinyin: Ānyáng; IPA: [án.jɑ̌ŋ]) is a prefecture-level city in Henan province, China. The northernmost city in Henan, Anyang borders Puyang to the east, Hebi and Xinxiang to the south, and the provinces of Shanxi and Hebei to its west and north respectively. It has a total population of 5,172,834 as of the 2010 census, 2,025,811 of whom live in the metropolitan area made of 4 urban districts and Anyang County largely agglomerated with the city proper. Xiaonanhai, on the far western edge of the city, was home to prehistoric cavemen during the Stone Age. Over 7,000 artifacts (including stone tools and animal bone fossils) have been unearthed here, representing what has been dubbed the Xiaonanhai culture. Around 2000 BC, the legendary sage-kings Zhuanxu and Emperor Ku are said to have established their capitals in the area around Anyang from where they ruled their kingdoms. Their mausoleums are today situated in Sanyang village south of Neihuang County. At the beginning of the 14th century BC, King Pangeng of the Shang Dynasty established his capital 2 km (1.2 mi) north of the modern city on the banks of the Huan River. The city, known as Yin, was the first stable capital in Chinese history and from that point on the dynasty that founded it would also become known as the Yin Dynasty. The capital served 12 kings in 8 generations including Wu Ding, under whom the dynasty reached the zenith of its power, until it was wiped out along with the dynasty that was founded by King Wu of the Zhou in 1046 BC. Anyang's Tangyin County was the seat of Yue Village, birthplace of the famous Song Dynasty general, Yue Fei. This was also the historic home of Zhou Tong, Yue's military arts tutor (though fictional sources place him in Shaanxi). The contemporary city was reconstructed in 1368 CE during the Ming Dynasty. In August 1949, Anyang prefecture was detached from Henan and – along with Puyang and Xinxiang – consigned to the experimental province of Pingyuan. All three were returned to Henan in November 1953, with the dissolution of Pingyuan. Anyang has a total administrative area of 7,413 square kilometres (2,862 sq mi), with elevation in this area tending to increase from east to west. The city actually lies on the border between steppe and the North China Plain, and as such, it has a four-season, monsoon-influenced climate, classified as a semi-arid climate (Köppen BSk). Winters are cold and very dry, with a January 24-hour average of −0.9 °C (30.4 °F). Summers are hot and humid, with July averaging 27.0 °C (80.6 °F). A majority of the annual precipitation of 557 millimetres (21.9 in) falls in July and August alone, and the annual mean temperature is 14.11 °C (57.4 °F). With monthly percent possible sunshine ranging from 43% in July to 58% in May, the city receives 2,225 hours of bright sunshine annually, with April to June the sunniest period. Extreme temperatures have ranged from −21.7 °C (−7 °F) to 43.2 °C (110 °F). The prefecture-level city of Anyang administers 4 districts, 1 county-level city and 4 counties. Anyang's opening to the outside world has enabled its foreign economic relations and trade to progress rapidly. Sixteen foreign-funded enterprises (joint ventures, cooperative enterprises and wholly foreign-owned enterprises) have been established. Recently, Anyang has established an economic and technological development zone covering a total area of 22.8 km2 (8.8 sq mi), and issued a series of preferential policies to attract many domestic Chinese and foreign businesses. A multichannel, all-round foreign relations and trade network has been set up to lay a foundation for developing Anyang's economy. Anyang city is an ancient city with a history of over 3,000 years and is one of the Eight Ancient Capitals of China, and also one of the best preserved. It is one of the key birthplaces of Chinese ancient culture. Here are the primitive caves of 25,000 years ago, the overlapping strata of the Yangshao Culture, Longshan Culture and Xiaotun Culture, the memorial mausoleums of ancient Emperor Zhuanxu and Emperor Ku over 4,000 years ago, the first library of inscriptions on bones and tortoise shells, the Soul Spring Temple, known as the "First Ancient Buddhist Temple in Henan", and 10,000-Buddha Ravine, as well as unique Wenfeng Pagoda, Xiuding Temple Pagoda and Mingfu Temple Pagoda. Anyang also has beautiful natural scenery—the Taihang Linlu Hill Scenic Area on the 400-kilometer Taihang Mountains and the grand 1,500-kilometer Red Flag Canal. Tianning Si (Mansion Temple) was established during the Zhou dynasty, and has recently been restored by the Protection and Research Institute of Ancient Architecture of Anyang City, and opened to the public. The main structures within the temple compound include: the gate house, the three-room (8.4m x 14m) Hall of the Heavenly King with hanging-eaves over the gables rebuilt in 2002, the slightly larger (17.8m x 11.65m) Precious Hall of the Great Hero with single-eave gabled roof originally from the Qing dynasty and rebuilt in 2001, and the Wenfeng Pagoda. Wenfeng Ta (Literature Peak Pagoda) on the grounds of the Tianning Temple is believed to have been constructed in 925 and is known, from inscriptions concerning the reconstruction of the temple, to have been in place by 952. The current pagoda was constructed during the Ming Dynasty and received its current name during the Qing Dynasty due to its proximity to the Confucian temple. The five-story dark red brick octagonal tower is 38.65m high and is, unusually, larger at the top than the bottom and is topped with a 10m Lamaist stupa-style dagoba steeple. The pagoda stands on two-metre-high stone pedestal and is decorated with multi-eave pent roofs and carvings of Buddhas and bodhisattvas. The unique pagoda is the symbol of Anyang. Located about 2 km (1.2 mi) northwest of Anyang are the ruins of the Shang Dynasty capital known as Yin. This massive archaeological site was discovered in 1899, excavated in the decades that followed, and first opened to the public in the 1980s as the Garden Museum of Yinxu. The current museum was opened on 16 March 2005, and includes the famous Tomb of Fu Hao. The site is inscribed on the UNESCO list of World Heritage Sites. ↑ Updated Asian Map of the Köppen climate classification system. ↑ 中国气象科学数据共享服务网 Archived March 2, 2015, at the Wayback Machine. ↑ "Hall of the Heavenly King". Tianning Temple. The Hall, an architecture of hanging-eaves over the gables, has a space of 3 rooms with a length of 14m, a width of 8.4m and a height of 9.6m. It was designed and rebuilt on the site by the Protection and Research Institute of Ancient Architecture of Anyang City in 2002. ↑ "Precious Hall of the Great Hero". Tianning Temple. The Precious Hall of the Great Hero, Tianning Temple, The Precious Hall of the Great Hero, as architecture of single-eave and gabled roof, is 11.65 meters long and 17.8 meters wide. Rebuilt in the 25th year of Qianlong in Qing Dynasty, it was thoroughly restored by the Protection and Research Institute of Ancient Architecture of Anyang City in 2001. 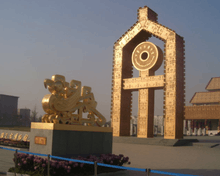 Wikivoyage has a travel guide for Anyang. Wikimedia Commons has media related to Anyang.